01.21.2007 - Everyone knows that pigeons poo. You can see lots of their waste in any city in America, particularly under the areas in which they roost. However, poop outside tends to wash away with the rain. In this case, pigeons were living inside an attic of a home, and it just doesn't rain as hard inside attics, and thus the poop accumulated. This pigeon waste buildup happened over only a few months - or so I'm told by the customer, though the birds could have been up there longer than suspected - and I found only five birds in the attic. I guess pigeons poop a lot! I flushed the birds out of the attic, and installed a special pigeon-excluder door on the entry hole, which allows them to fly out but not get back in, and then I had to clean this mess. I simply removed all of the heavily soiled insulation and then fogged the attic with a special enzyme based cleaner to kill all remaining pigeon waste that I missed, and also any parasites and pathogens. The homeowner will have to call in another company to add new insulation, since that is a service that I don't provide. 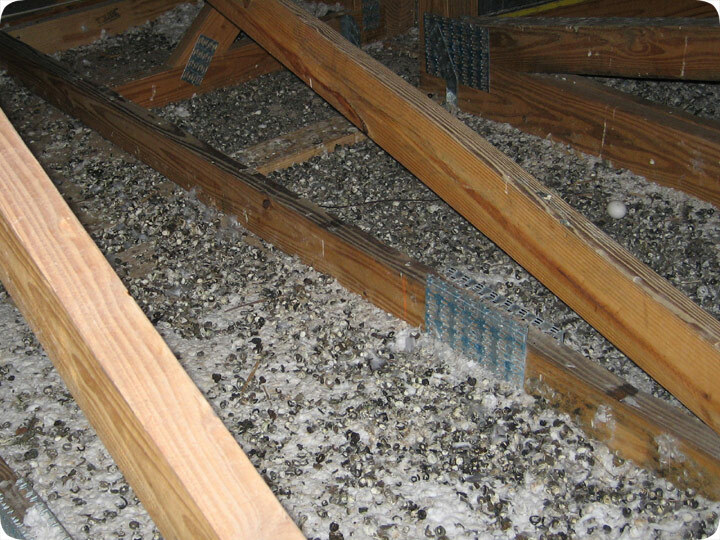 The problems with bird or pigeon droppings, or any animal droppings, for that matter in an attic is fourfold. First of all, the droppings tend to grow fungus or mold over time. This mold can often release airborne spores that the people inside the home can breathe, leading to lung infections such as histoplasmosis. The second problem with droppings in the attic is that the scent can actually attract new wildlife into your home. Whether it's the same species looking for a mate, or to beat the competition, or is simply drawn to a proven bat home, they will be drawn in. Some animal droppings and urine actually contain pheromones meant to attract more animals. Droppings can also attract predators. The third problem is that the droppings are often laced with diseases that humans can catch. For more information, click animal poop diseases. The fourth problem is that the droppings may make your home smell bad. However, this is a lesser concern. You may want attic decontamination or even animal insulation replacement if you have animal waste in the attic, especially pigeon droppings.